Last weekend, the two major contenders for the honours this season, Stompers and Overseas, came head-to-head a second time following the new season’s curtain-raiser – the Ray Elliot Cup – which went Stompers’ way. This time, however, a resilient Overseas team had the last laugh after coming from behind to win a thrilling match and go top of the Cisk League standings. Stompers started strongly and Richard Gum kicked them ahead from a penalty. Both sides fought for territory. From a penalty, Overseas shifted the ball out wide leading to Ouassim Mhaouch’s try, converted by Chris Briffa. The match developed into a heavy contest for possession with referee Lionel Da Silva calling multiple penalties for infringements in the rucks. Eventually though, the ball found itself in Gum’s hands. He sped to a brilliant run, dodging multiple tackles to ground the ball in the corner of the try zone. Gum failed to convert his own try and Stompers held a narrow 8-7 lead. Stompers appeared to hold an edge at this juncture. On one occasion they lost possession within metres of the try line due to yet another infringement. But they won back possession, handing winger Josef Azzopardi a try which was converted by Gum (15-7). The rest of the first half consisted of a series of excellent breaks by Stompers. It was only in the final moments before the interval that Overseas finally succeeded in taking advantage of an overlap, allowing fly-half Gareth Corcoran to score the try, converted by Briffa. At the break, Stompers led 15-14. Stompers’ defence held strong against their opponents’ persistent attacks as the second half got underway. The pattern did not differ though with possession only changing with infringements. It was from one of these occasions that Overseas would find themselves in sight of the posts as Briffa’s kick hit the target for his team to regain the lead. The referee then handed out the first yellow card of the match, sending Overseas flanker Luke Galea to the sinbin for a trip to an opponent. Stompers capitalised on the situation to bring the ball across the line, this time via Jeremy Debattista. His runs were central to his team’s attacks as the score now stood 20-17 for Stompers. The two teams went all out for the win before Debattista embarked on another run from the half-way line, beating three tacklers and providing an excellent opportunity for Dragan Cerketa to get the ball across the line, conversion by Gum. Ten points behind, Overseas lost their plot at first as they failed to convert a few of their attacks into points, even missing a kick at the posts from a penalty. But then flanker George Corner took advantage of a gap in the Stompers’ line to score a try. With the conversion, Overseas were only three points behind now (27-24) to set up a tense finale. Knowing full-time was near, Stompers worked to maintain possession. However, in the last play of the match Overseas found themselves deep in attack. 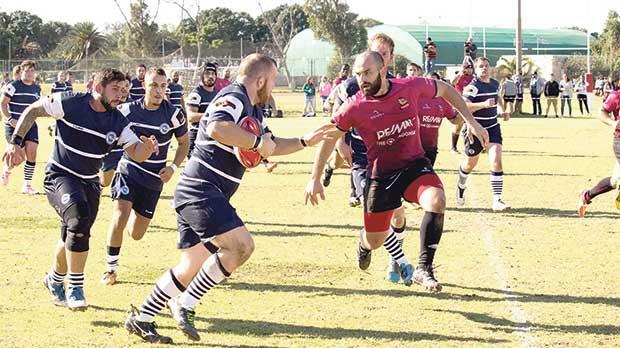 Stompers blocked all avenues to their try line until Matthew Spiteri was yellow carded for a high tackle, giving Overseas the breakthrough they were looking for. Corner scored a try, converted by Briffa and the comeback was complete. Men of the match: Jeremy Debattista (Stompers); George Corner (Overseas).